December Graduates: There are plenty of job opportunities for you! If you want to take a gap year or two before law school, a job at a law firm is a great idea. Law firms often hire recent graduates to be project assistants, junior paralegals, and legal assistants. Job Description: The Project Assistant works under the supervision of a paralegal on all aspects of a case which includes creating and maintaining case files, assisting with trial preparation and performing document production. Job Description: With offices in Chicago and Edwardsville, Illinois, Sinars Rollins L.L.C. is dedicated to defending product manufacturers, premises owners, distributors and contractors in product liability and toxic tort claims. The job opening is for the Chicago, Illinois office. Job Description: The ideal candidate should have a college degree and either previous exposure to the field of Intellectual Property or an office environment. However, college graduates or self-starters with strong problem-solving skills, but no previous IP or office experience, will be considered. Candidate must have a working knowledge of Microsoft products and an accurate minimum typing speed of 50 wpm. Position requires excellent attention to detail, strong organizational and prioritization skills with the ability to meet deadlines. Analytical thinking and problem solving skills are essential. Job Description: The Project Assistant is responsible for performing a variety of duties, under general supervision and according to established policies and procedures, to assist attorneys and paralegals, primarily with the Government Advocacy & Public Policy and Business Litigation Practice Groups, as well as any other team in need. Maintains positive contact with clients and observes confidentiality of client matters. Job Description: Project Legal Assistants assist our legal staff in preparing for depositions, due diligence investigations, pre and post-closing transactional work, document productions, and hearings and trials. Under the appropriate supervision and reporting to the Legal Assistant Manager, the qualified candidate will effectively support attorneys and senior legal assistants on a wide range of legal tasks from case inception through case closure. Job Description: A two-year position supporting paralegals and attorneys in various practice groups. This position is an opportunity for individuals interested in law school to gain legal experience. Job Description: The Los Angeles office of Kirkland & Ellis LLP is seeking a Litigation Jr. Paralegal who, under the supervision and direction of a Paralegal, helps to manage and organize the materials and information relating to particular matters and transactions. These duties allow them the opportunity to work with and assist our legal staff in preparing for depositions, due diligence investigations, document productions, trials. The projects typically involve basic file organization tasks and may require long hours and travel. Job Description: The Litigation Legal Assistant at Cravath, Swaine & Moore LLP works in a team environment assisting litigation attorneys in all phases of the litigation lifecycle, ranging from pre-complaint investigation through trial and appeal. This position is located in our New York office and the start date will be in December 2017 or January 2018. Make sure your resumes and cover letters have been reviewed before applying to these positions or any others. The Career Center is offering Resume, Cover Letter, and LinkedIn Reviews this week and next! The Career Center’s Resource Center is located at 715 S Wright St. Champaign, IL 61820, just across from the Alma Mater. Welcome back! We hope your break was relaxing and got you geared up for final exams, which begin on December 15. Our PLAS Fall Events Calendar is complete. We will resume our programing in January, beginning with our Pre-Law 101 Workshop on Monday, January 29, followed by the LSAT Test Prep Fair on Tuesday, February 6. In the meantime, stay tuned for our Annual Internship Newsletter, which will be posted the week of December 11! This resource will contain over 15 pages of suggestions, ideas and actual internships for Summer 2018. Note – winter break is the best time to apply for summer internships as many of these opportunities have January application deadlines. Mark your calendars! Career Center events of interest to pre-law students include the following list; check www.careercenter.illinois.edu for location & other details and to register. Social Justice Education Paraprofessional Program is taking applicants! Sidley Scholars Program–Juniors and Seniors planning on attending law school in the Fall of 2019: consider applying for the Sidley Austin LLP Summer Pre-Law Scholars Program. This program helps to subsidize the cost of LSAT Prep and offers possible additional scholarships. Scholars will receive up to $2,500 in benefits to fund the LSAT, CAS credentialing, pay tuition in a commercial LSAT preparation course, as well as reimbursement for application and CAS fees for up to seven law schools. Scholars further may be eligible to receive an additional $2,500 scholarship award, in two installments. Scholars will receive $1,250 when they have (1) successfully completed an approved LSAT preparatory course, (2) taken the LSAT, and (3) applied to at least five accredited law schools. Finally, each Scholar will receive a final $1,250 scholarship distribution once the Scholar has informed Sidley that he or she has been accepted to, and is committed to start law school at, an accredited law school and has attended the entire Sidley Scholars Summer Seminar in the summer immediately preceding the Scholar’s matriculation at that law school. Click here for more information. Application materials are due Friday January 12! What exactly does the patent bar cover? When and how often can you take it? How do people prepare for the exam? What is the format of the exam, and how are results received? What is a passing score for the exam? He’ll also answer any other questions you have about the patent bar exam. This session is specifically designed for those undergrad and graduate students in engineering, science, or technology disciplines who are eligible to sit for the patent bar. For a list of eligible majors or backgrounds visit https://www.uspto.gov/sites/default/files/OED_GRB.pdf This is a free event. Today’s Personal Statement workshop is cancelled due to low enrollment. Explore our personal statement resources, including our video and handout, on the Pre-Law Compass page, and make an individual appointment for a personal statement review when you are ready. College of Law Events–Pre-law students are invited! From White House to City Hall: Thoughts on Lawyering in the Executive Branch will be presented by Edward N. Siskel, City of Chicago’s Corporation Counsel, on Nov. 14 from 12-1 pm. Mr. Siskel will share his thoughts on some of the challenges, rewards, and responsibilities that come with providing legal counsel to Executive Branch leadership on the federal and municipal levels. He offers a unique perspective on issues ranging from managing investigations into senior executive branch officials, preserving the independence of the Department of Justice, and defending sanctuary cities against the Trump Administration’s efforts to withhold federal grant funds. The lecture is free and open to the public. Lunch will be provided to lecture attendees. Writer’s Workshop presents the following workshops. Click here for more information. 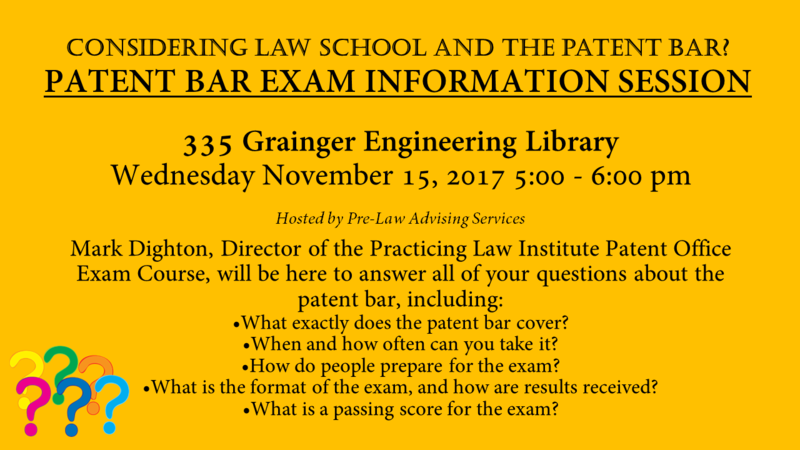 Patent Bar Exam Session is next Wednesday November 15. This session will be led by Mark Dighton from the Practising Law Institute from 5:00 – 6:00PM. There has been a location change for the event. For more information click here. See you there! There are different strategies for LSAT Prep. If December is the first time you will be taking the LSAT, here are a few common sense pieces of advice to help you prepare. The test consists of five 35-minute sections of multiple-choice questions. Four of the five sections contribute to the test taker’s score. These sections include one Reading Comprehension section, one Analytical Reasoning section, and two Logical Reasoning sections. The unscored section, commonly referred to as the variable section, typically is used to pretest new test questions or to preequate new test forms. The placement of this section will vary. Identification of the unscored section is not available until you receive your score report. A 35-minute, unscored writing sample is administered at the end of the test. Copies of your writing sample are sent to all law schools to which you apply. 1. Take a FULL LENGTH PRACTICE LSAT. Ideally, take multiple full length practice LSATs. The LSAT will take often 4 to 5 hours depending on breaks. Whether it is through a prep class or studying on your own, take practice tests in a timed and distraction-free setting. One of the most difficult parts of the LSAT is endurance and sitting through the entire test. Full length practice tests will help prepare you. The LSAC offers a free sample test (June 2007 exam). Click here to access the free practice test. When you do a practice exam, do the writing portion! It’s easy to ignore this portion of the exam during your preparation, but it is a part of the test you have to do on test day. Click here to see the LSAC’s example writing topics. 2. It is highly discouraged to take the LSAT “cold” or without any studying. All of your LSAT scores are sent to law schools. Law schools care if you prepared for the exam and that you put in your best effort for the exam. The LSAT is not an exam that you can walk into with minimal to no preparation. 3. Remember, the suggested amount of time to prepare for the LSAT is 4 to 6 months of regular studying. The LSAT measures critical thinking skills, and while these skills CAN be learned, they usually take a lot longer to learn than fact-based knowledge. Four to six months of consistent studying for 10-15 hours a week is highly recommended in order to be fully prepared for this exam. 4. If you are not prepared for the exam, seriously consider whether or not you should take it or delay the test. Here is the LSAC’s information about changing test centers, test dates and refunds for the December 2017 exam. Although the test center, test date change, and registration refund deadlines have already passed for the December 2017 exam, you can still withdraw from the exam until the day before. It may be better to withdraw than to go through with the test and achieve a low score. The next LSAT is Saturday February 10, 2018. Not taking the LSAT until next year? Plan on attending the LSAT Prep Fair on February 6, 2018 to learn more about your test prep company options! Taking the February 2018 LSAT? The test is only a few months away. In our next blog post we will share LSAT Prep Resources, so stay tuned. Pre-Law Advising Services is helping to organizing LSAT study groups for the February 2018 LSAT. We will organize groups based on the availability you specify in the google form. Sign-ups for the LSAT study groups will close by Thursday November 9th at 12PM. Study groups will be assigned next week. Pre-Law 101: Tomorrow Tuesday November 7 at 4:00 pm in 514 Illini Union Bookstore Building. This workshop is designed for incoming students who are new to pre-law or are interested in learning more about it. We will cover: What it means to be pre-law at Illinois, course selection, majors, and extracurriculars, building a pre-law resume, and what law schools are really looking for. We will outline a four year plan to maximize your undergraduate experiences in order to make a great law school candidate. We’ll also take any questions about law school and legal careers. Incoming students should attend a Pre-Law 101 prior to setting up an individual pre-law advising appointment. NOTE: THIS IS THE FINAL PRE-LAW 101 OF THE SEMESTER. 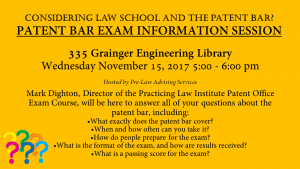 Interested in Patent Law and the Patent Bar? Do not miss this great event! He’ll also answer any other questions you have about the patent bar exam. This session is specifically designed for those undergrad and graduate students in engineering, science, or technology disciplines who are eligible to sit for the patent bar. For a list of eligible majors or backgrounds visit https://www.uspto.gov/sites/default/files/OED_GRB.pdf This is a free event. Please register at the link here so that we can ensure enough seating and materials for everyone. Writer’s Workshop–Interpreting & Using Critical Feedback Workshop on 11/7/17 4:00pm-5:00pm, Lincoln Hall, room 1024. Feeling overwhelmed by the critical feedback you’re receiving from your professors, advisers, and/or collaborators? This workshop will help you assess, integrate, and respond to critical feedback in the revision process. The workshop will be most helpful to graduate students or undergraduates working on senior theses or capstone projects. Struggling with figuring out which major to choose? Then this workshop is for you! Learn about how you can find a major that’s the right fit. Want to learn about editing and proofreading skills? In this workshop, we will define these writing skills and help writers develop and practice effective strategies for both. Interested in other Writers Workshop Events? Click here for more information. Wednesday, November 8 12-1 p.m. The talk will explore how globalization has increased the economic costs of isolationism, and how the United States should engage in a rules-based trading system rather than retreat from it. “Promises, Mandates, and Social Norms: Title IX at 45” Presented by Fatima Goss Graves, President and CEO of the National Women’s Law Center, will present the David C. Baum Lecture on Civil Liberties and Civil Rights. Thursday November 9, 2017 12-1 p.m.